Prohibition General Signs - A prohibition sign is a safety sign prohibiting behaviour likely to cause a risk to health and safety. These health & safety signs are required to be red show only what or who is forbidden. Prohibition safety signs generally depicted a black safety symbol in a red circle with a diagonal cross through. Prohibition signage, or “no” signs, are often accompanied by the instruction “No” or “Do Not” such as do not enter, and no smoking. 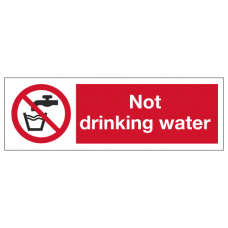 You will find a vast amount of stock prohibition signs in this section, if you require a bespoke Prohibition Sign head over to our Custom Signs section to create your own.